This cake is decadent and spooky all at the same time. A moist, fudgy mocha cake is topped with a light and chewy chocolate meringue. Corpse fingers and moss cookies are added for a spooky sight. Even if you don't want to decorate the cake for halloween, the mocha meringue cake is worth the effort. cookies : Preheat the oven to 400 degrees F and line a cookie sheet with a silicon mat or parchment paper. 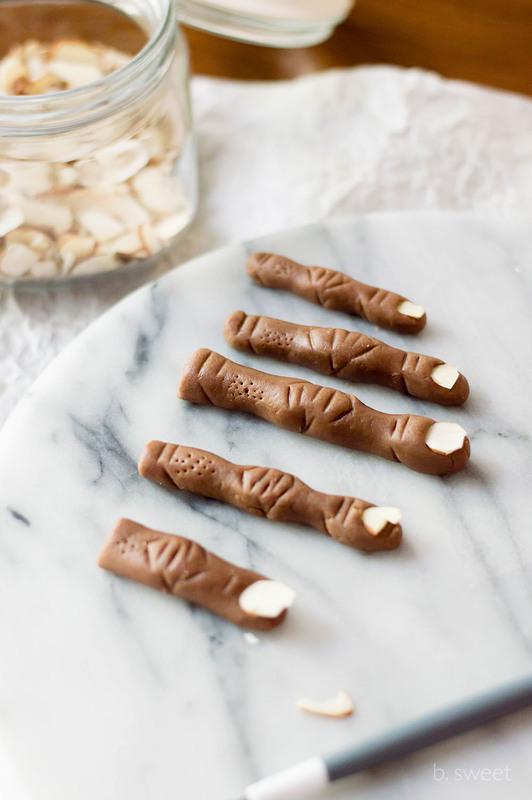 For Corpse Fingers - Use the uncolored dough to form 5 fingers. You want to make them slightly skinnier and exaggerate the features as they will puff slightly in the oven. Using your own fingers as a guide, use a tooth pick or modeling tool to make imprints on the knuckles and fingernail beds. Then, place almond slices as fingernails. I like the look of broken almond slices. Using a toothpick skewer the finger at the bottom. (This will help you add the fingers to the cake later. Put the fingers on an half tube pan and put in the freezer for 10 minutes to chill. (this will help the cookie hold their curved finger shape.) If you don't have a tube pan try an oven safe bowl to form the curve of the fingers. **I found that skinnier fingers baked better on the tube pan without slipping off or deforming. Place the half tube pan on a cookies sheet (incase any fingers slip off) and bake for 10 minute. Let cookies cool on the tube pan to hold shape as they harden. After your cookies have cooled, you can use a microplane to carefully shape and sculpt the fingers to a more realistic shape. I used it to add an indention where the fingers bend. To give the underside of the cookie a more realistic shape instead of staying smooth from baking on the tube pan. For Moss - Pinch off pieces of the green dough and use your thumbs to press onto a parchment or silicone mat lined cookie sheet. Make irregular shapes in different sizes. Bake in the 400 degree F oven for 8-10 minutes until the cookies just begin to brown on the sides. Let the cookies cool and reserve for decorating the cake. cake : Preheat the oven to 325 degrees F and butter and line a 9 inch springform pan with parchment. In a small saucepan over low heat, melt the butter and chocolate together. Then, remove from heat and set aside to cool. In the bowl of a stand mixer fitted with the whisk attachment, add 2 whole eggs. Separate the remaining 4 eggs. Add the 4 yolks to the bowl of the stand mixer and reserve the remain 4 whites for making the meringue. Combine the brown sugar, eggs and eggs yolks until light and foamy (a least a full minute of mixing). Gradually add the chocolate butter mixture to the eggs and sugar. Then, mix in vanilla bean paste and coffee. In a separate bowl, whisk together the flour, baking powder and salt. Then, gradually add to the egg mixture. Mix just until everything comes together and the flour is moistened. Add the batter to the prepared springform pan and bake for 20-25 minutes. The cake should be set on the sides but still have a little wobble in the middle. While your cake is baking prepare the meringue. Add your reserved 4 egg white to the bowl of a stand mixer fitted with a whisk attachment. Whisk until soft peaks form. Then, gradually add in the sugar and whisk until glossy. At this point add vinegar and whisk for an additional 1-2 minutes. Whisk until you reach stiff peaks. In a separate bowl, mix together the cocoa powder and cornstarch. Then, gently fold into your meringue. When your cake has baked, increase the oven temperature to 350 degrees. Then, top the partially bake cake with the meringue. Bake for 30 - 35 minutes. Remove from the oven and let cool for 15 minute before removing the sides of the pan. for decoration- Once your cake has cooled dust with more cocoa powder. Then, use the toothpicks to secure the corpse finger cookies to the cake. Place 2/3 of the moss cookies onto the cake around the fingers. Then crumble to remaining 1/3 of the cookies over the placed moss cookies to add texture. I also pinched the meringue to add a few more cracks along the edges of the cake.